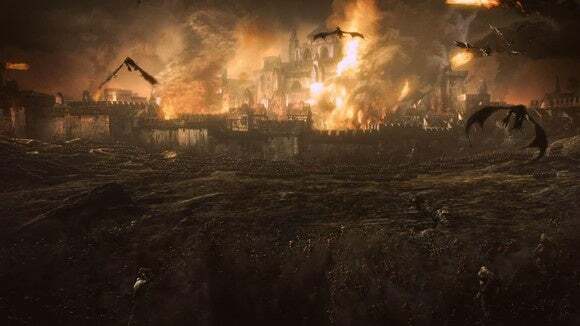 All the series needed was ten-foot bats and skeleton cavalry. The scenes are similar in the latest Total War, but the actors have all changed. Where once I led legions of sword-wielding Hastati into the barbarian ranks, now a group of zombies shuffles down the hillside. Scout cavalry have been replaced with massive bats that dive and swoop through enemy troops. A flanking charge is conducted by wolves, backed up by skeletons on shadowy steeds. And above it all, the guttural cries of the devious Vampire Count Mannfred Von Carstein, true lord of Sylvania. He wades into foes alongside a Vargheist (a ten-foot tall bat) and a banshee, killing troops with a single blow and then feasting on their blood to regenerate his own health. That’s way cooler than anything the boring ol’ Roman Empire ever did. This is Total War: Warhammer ($60 on Amazon) or, as it’ll be known for the rest of this article, Total Warhammer. 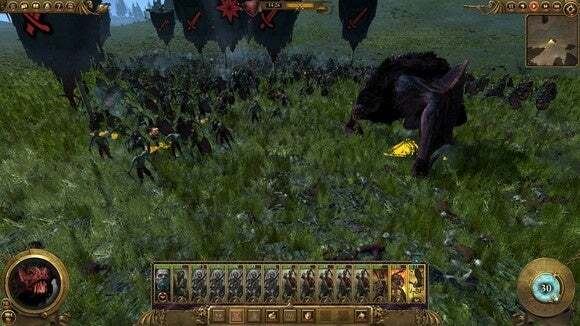 As you’ve no doubt guessed from the title, it brings a bit of the fantastical Warhammer tabletop universe to Creative Assembly’s Total War series. It’s a big shake-up, following on fifteen-odd years of historical hybrid-4X/RTS campaigns. The maps and factions and units of Total Warhammer make for a massive change after Japan (twice), Medieval Europe (twice), Rome (two-and-a-half times), the Colonial Era, and the Napoleonic Age. More important: It’s a refreshing shake-up. 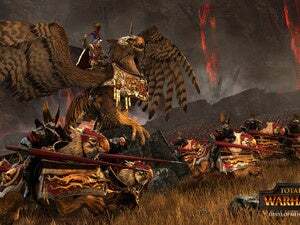 Total Warhammer not only surpasses the low, low bar of “Best game in the series since Shogun 2,” it also represents a direction the series should embrace more generally. Which is not to say Creative Assembly should stop making Total War games based in history. I’d love to see another Medieval game or, you know, an Ancient Greece or World War II or whatever the hell CA wants to dabble in. And obviously those settings are constrained by human history, so no ten-foot tall bat units or zombies or what have you. 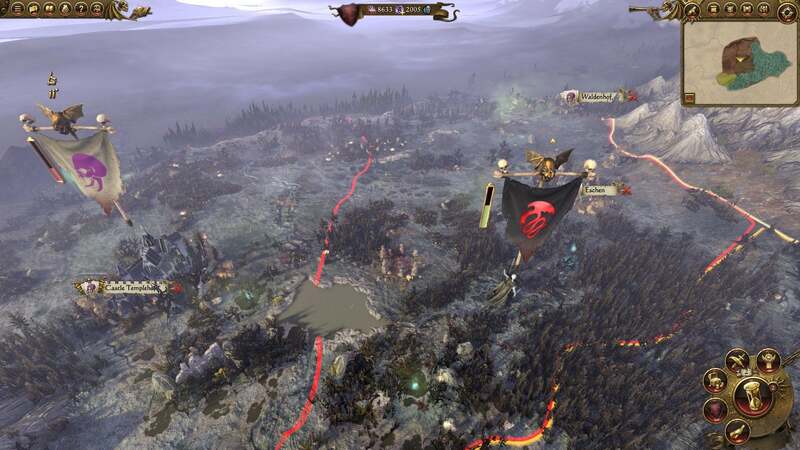 Even so, there’s quite a bit to like about Total Warhammer. For one, the fact that all four (five, with DLC) campaigns play measurably different. Dwarfs, for instance, field small numbers of high-upkeep, high-power units—Hammerers, Longbeards, et cetera. A standing army is expensive, but they counter that by mining for gems and precious metals. Vampire Counts, on the other hand, field massive armies of skeletons and zombies to overwhelm with numbers. Some of your units died? No problem, just raise the dead on your next turn and you’ll recover a portion of your lost strength. And it goes beyond combat. Total Warhammer is great at making the set-up of each faction feel important. The Dwarf campaign focuses on High King Thorgrim Grudgebearer, set on restoring his people to their former glory. Doing so means reuniting ancient kingdoms and taking back lands stolen by the Greenskins, and as such you’re encouraged to ally with your fellow Dwarf lords early and fight together. Our Vampire friend Mannfred Von Carstein is in the opposite situation. He returns to Sylvania to find a pretender ruling over his domain. Your goal is to dismantle this rival’s false empire. Internal struggle. It’s not that Total War has never experimented with asymmetrical factions. Go way back to the early days and you’ll find faction-specific units, or even entire armies that favored a specific style of play (better cavalry, speedier foot soldiers, and the like). More recently, Total War: Attila introduced Nomadic Tribes—factions where armies were synonymous with cities. But Total Warhammer takes all those half-ideas and formalizes them, wraps them into the lore. Dwarfs get a public order penalty the more battles they lose, carefully noting every grudge down in a hefty tome. The Empire forms from a loose confederacy into an unstoppable tide. Vampire Counts fight internally until there’s no one left to fight, and then decide to kill everyone else and defile their lands for good measure. Greenskins armies start suffering attrition if they haven’t been in enough battles recently. On the one hand, this tendency towards compartmentalization makes the map feel smaller, more constrained. On the other, it means the early game is a lot more manageable—you have a clearly defined goal and a reasonably good guess how to go about achieving it before the game opens into full-on sandbox for the larger end-game goals. Faction leaders now influence the story Total Warhammer tells. An early Dwarf quest battle, for instance, pits you against a Greenskin ambush in the depths of the Underway, a network of subterranean tunnels. Others unlock as you level your hero, sending you on a quest to go find that character’s legendary items and usually culminating in a similarly climactic battle. These are drawn from Warhammer’s extensive lore, with names and identifiable locations and familiar setups. It’s a bare minimum amount of storytelling, but it’s there and helps lend credence to the world. And the battles themselves are spectacular, often throwing multiple stacks of units up against each other. 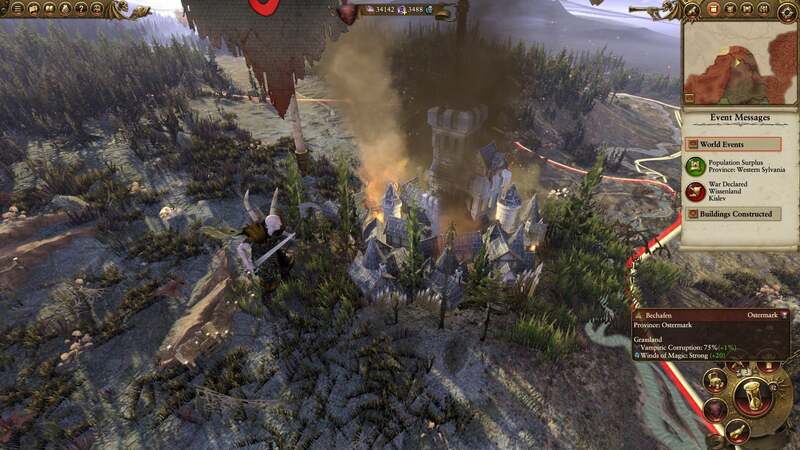 This is Total Warhammer’s real-time aspect at its most blown-out and impressive, and it’s telling that the game doesn’t let you auto-resolve these battles. 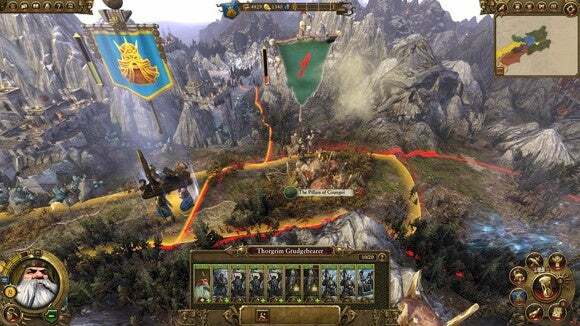 Put it all together—different units, army styles, leaders, territories, quest battles—and Total Warhammer seems a massive cut above Attila’s tentative forays into asymmetrical play, to say nothing of the stagnation of Rome II. It feels like four different games. Four good games. But it’s so much more than just Total War. Even with Attila making good on some of Rome II’s promise, I found myself dreading drawn-out engagements and increasingly bored with the Total War formula. Total Warhammer doesn’t tamper with much, but it injects enough personality to revive a series that’s been steadily collapsing under its own weight. The question now is whether see some of its better ideas brought back into Total War proper. A Medieval game with the Battle of Hastings or Falkirk. Another stab at Napoleon, but focused in on the differences between factions. 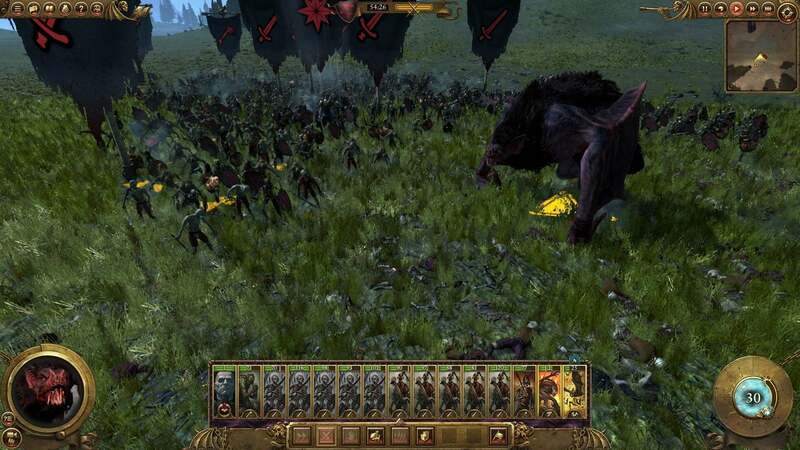 Again, it’s not like I expect to see ten-foot tall bats stalking the fields of circa-1800 France, but Total Warhammer proves a bit more variety is the cure to Total War’s woes. After a dismal couple of entries, Total War: Warhammer proves that maybe all the series needed was ten-foot bats and skeleton-cavalry.